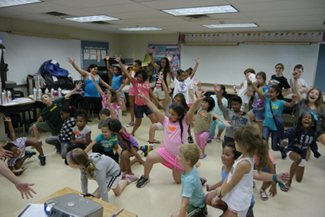 Our little community hosted its 4th annual kids-in-motion sports and arts camp the week of July 21 -27! The camp that began 4 years ago with 30 1st thru 5th grade campers has grown to bless over 150 campers from a low income area of Easton! The people of the West Ward community we live in… the gatekeepers of our city (Easton)… and the secular agencies who serve the poor sand oppressed of our city (Weed and Seed, West Ward Neighborhood Partnerships and Easton Area Community Center)… have taken note… are partnering with us… and are thankful for our presence! Ironically and of note is that we have not seen a lot of families who we bless join in the journey our church community, but we do see God using it to encourage others who want to be a part of a church community on mission to join with us! I think the lesson in that is that we do not have to, not maybe should we seek to be a blessing merely to grow our communities, but that we bless for blessings sake and leave those who journey with us in the hands of God!